In 1993 David Lowry helped write the song Low. Whenever it's played on the radio he gets 40% of the writer's royalty, and he's angry at Pandora for ripping him off. But are they? Pandora is an internet radio station that customizes itself to your tastes. 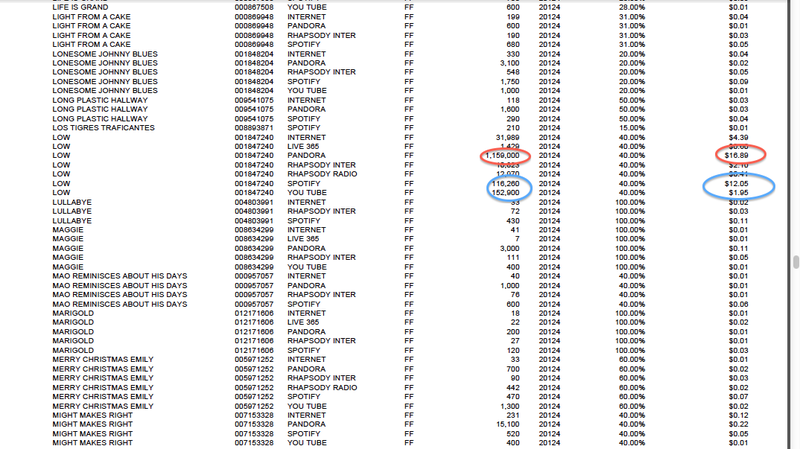 Pandora has been paying Lowry 0.0015¢ per play, while standard radio stations have been paying him 7.3¢ per play. This sounds like a huge difference, but only if you ignore that many more people listen to a standard radio broadcast. If that's 1K then Pandora pays less, but if it's 10K then Pandora pays more. In the US the company that measures radio listeners is Arbitron. Strangely, "Arbitron urges those reviewing audience estimates from Internet music services not to make direct comparisons to Arbitron audience estimates in any market" (pdf), which is of course exactly what I want to do. Their reasoning for not doing this is fuzzy, however, and mostly sounds like they don't want to make traditional radio look bad. They say it's important to read their "Description of Methodology", but I can't find that on their site or with searching. I did find a 1996 version (pdf), however, and I didn't see anything unexpected in how they calculate "Average Quarter Hour ratings". It's just the number of people in their sample listening to a given station on average in a 15 minute period, scaled up by the ratio of people they sample, and adjusted for ways the composition of their panel differs from the composition of the country. If they say the AQH rating of a station is 0.5, that means they think on average 0.5% of the market area served by that station is tuned into it. Similarly, AQH persons is their estimate of the average audience size of a station. What I'd like to see is the average AQH persons of all radio stations in the country. This would be a good estimate for the number of people who listen to an average broadcast. Unfortunately Arbitron likes to keep audience estimates quiet, requesting distribution be limited to market share and cumulative listening numbers. This means that when you look around the web those numbers are easy to find, but they're not what I want. I did find one radio station publishing their audience size numbers, WUSF, an NPR/classical station in Tampa FL. The numbers they distribute say they get 25K listeners at any one time. Arbitron will let you look up market share, and WUSF has 1.8% of the Tampa market. The kind of station that would be more likely to play Low are the top ones in the market, at around 6%, so those stations are probably closer to 83K listeners. Arbitron lists the size of this market as 2.5M people, and the average from that list is 0.8M people or only 33% of the size of the Tampa market. Scaling 83K down by 33% we get an average number of listeners, per station that would play Low, of 28K. 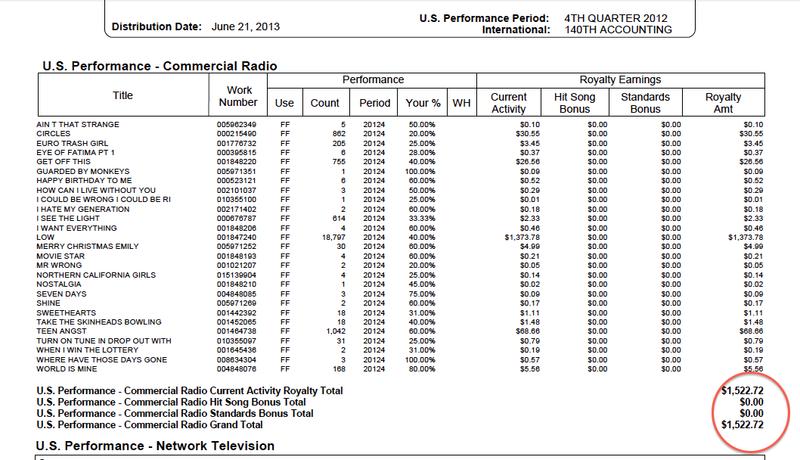 Our initial numbers were 0.0015¢ per play for Pandora vs 7.3¢ per play for regular radio. Converting that from payment per play to payment per listen based an an estimated average audience size of 28K for regular radio, we get 0.0015¢ per listen for Pandora and 0.00026¢ per listen for radio: Pandora is paying Lowry five times as much.